There has been recurrent talk of radically downsizing the city’s fleet of clapped-out and largely unregulated minibuses, which form the backbone of Bishkek public transportation system. Kyrgyzstan's government admits Bishkek has a problem and that it is creating serious health concerns. 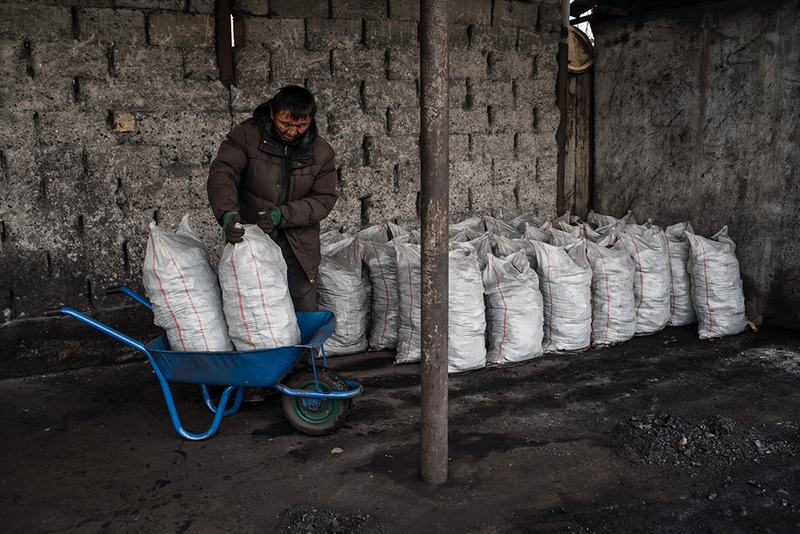 A man hauls sacks of coal used to heat homes in the Kyrgyz capital. One of the main culprits for the pall of smog that now hangs heavy over Bishkek is poor urban planning. Authorities estimate that of the 240,000 tons of harmful emissions pumped into Bishkek’s air each year, around 180,000 tons come from cars. 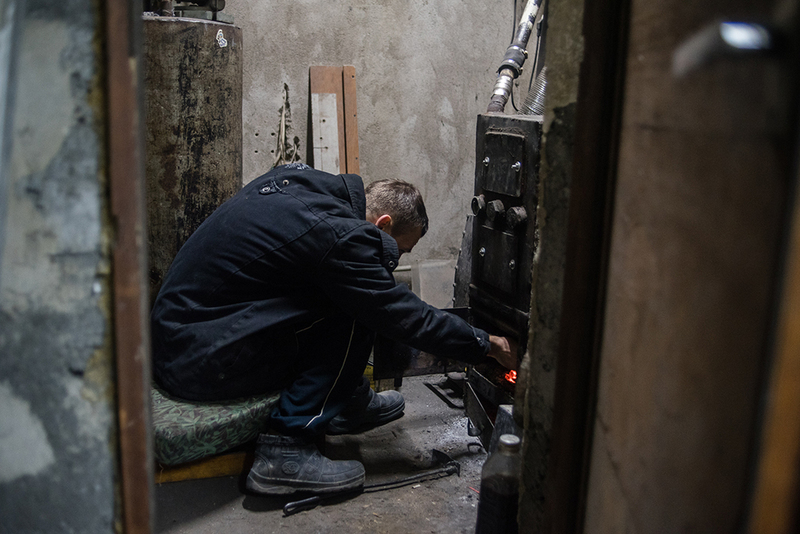 Coal-heated household stoves cause much of the pollution. 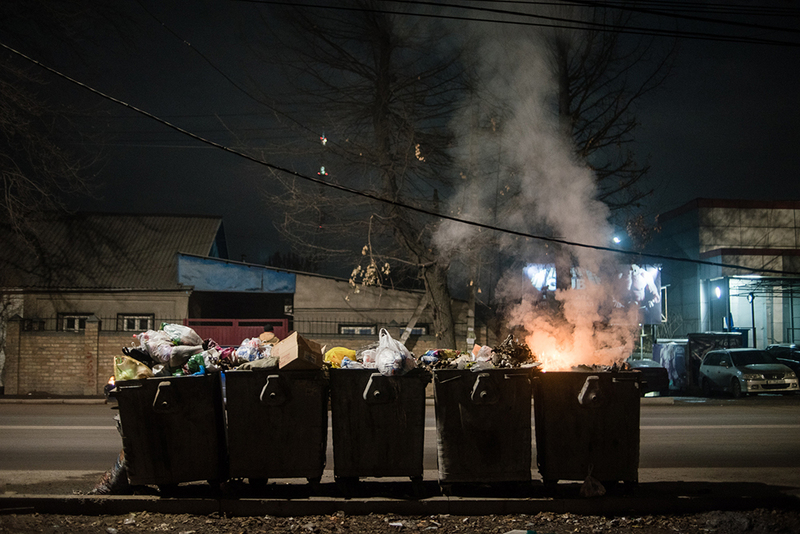 Dumpster fires don't help the air quality. Nobody would ever have accused Bishkek of having the cleanest air. 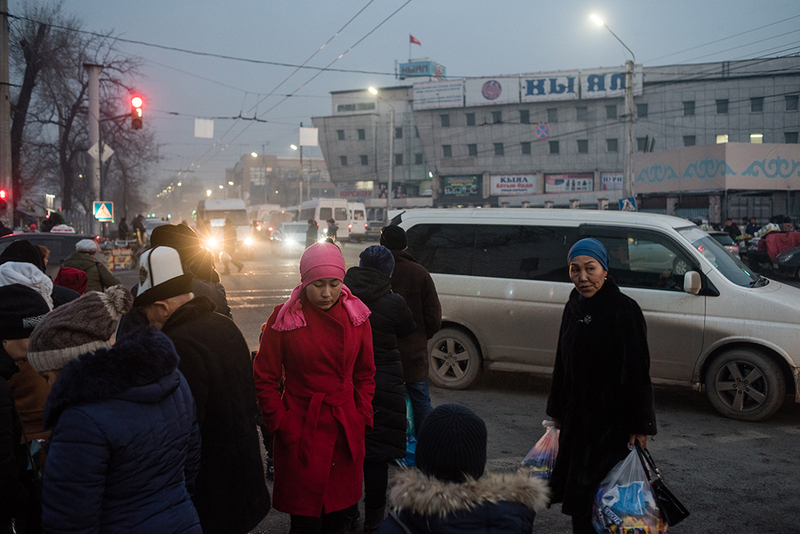 But this is proving an especially bad year for smog in Kyrgyzstan’s capital. Earlier this week, a spokesman for the government admitted that the city has a problem creating serious health concerns. State bodies “should not lose touch with reality and close their eyes to the problem, and they should concentrate on devising real measures to protect the environment,” a spokesman for Prime Minister Mukhammedkaliy Abylgaziyev was quoted as saying by RFE/RL’s Kyrgyz service, Radio Azattyk. This is proving a bitter realization for what was once famed as a charming, tree-lined city. Drone footage from local news agency AKIpress. 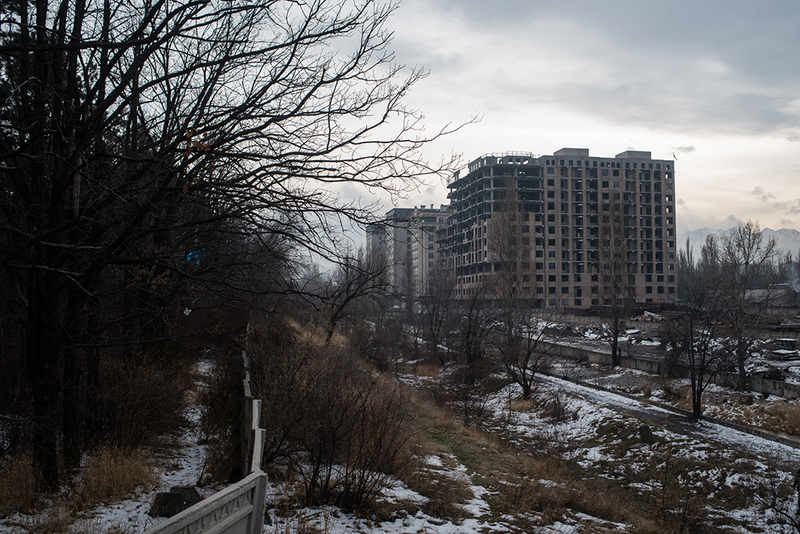 One of the main culprits for the pall of smog that now hangs heavy over Bishkek is poor urban planning. Over the past few years, large numbers of high-rise buildings have gone up with little supervision, with the result that the refreshing air that used to descend from mountains in the south is unable to circulate freely. Abylgaziyev has said he wants to ban tall buildings in critical ventilation areas. The Union of Architects of Kyrgyzstan endorsed that idea this week, calling for a moratorium on construction in the center. “In the past 10 years we have built up on urban river terraces, in southern neighborhoods and in the city center, which is all highly undesirable. As is known, buildings in the center should be no higher than seven stories,” Belek Sarymsakov, deputy chairman of the union, was quoted as saying by the 24.kg news agency. If developers were indeed aware of that height limit, it is clear that few are taking notice. As to the source of the dirty air, much comes from coal-heated household stoves and car exhaust. 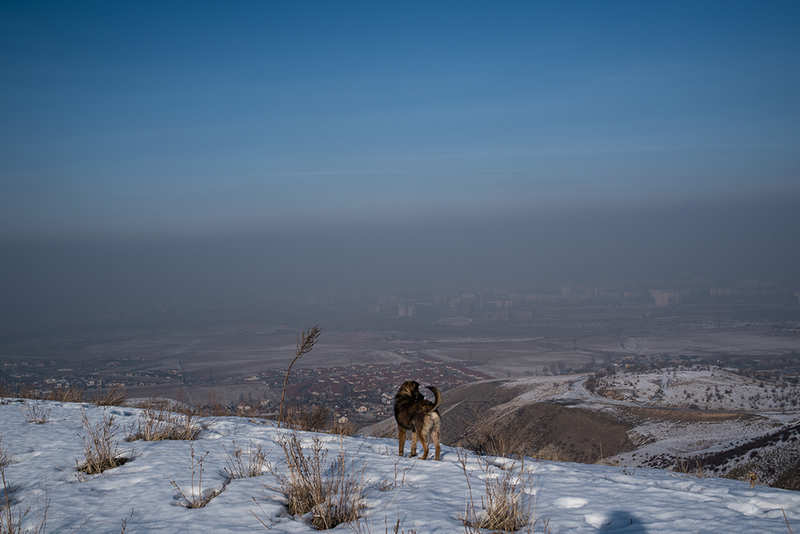 The State Agency for Environmental Protection and Forests estimates that of the 240,000 tons of harmful emissions pumped into Bishkek’s air each year, around 180,000 tons come from cars. 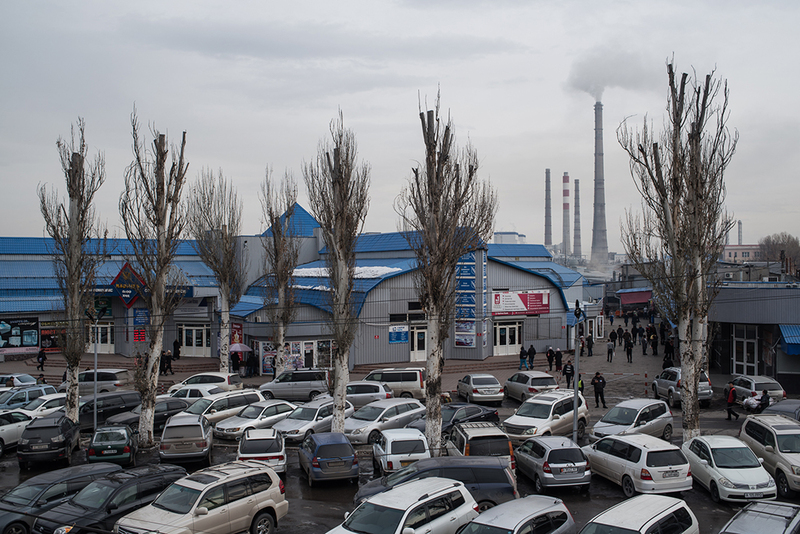 One quick-fix solution touted by Abylgaziyev has been to urge utilities company Gazprom Kyrgyzstan – a subsidiary of the Russian gas giant – to speed up its efforts to link more Bishkek residential areas to the gas grid, thereby obviating the need for burning dirty coal. And there has been recurrent talk of radically downsizing the city’s fleet of clapped-out and largely unregulated minibuses, which form the backbone of Bishkek’s public transportation system. The town hall announced this week that it has issued a tender to buy around 60 new gas-run buses. Danil Usmanov is a photo and video journalist based in Bishkek.